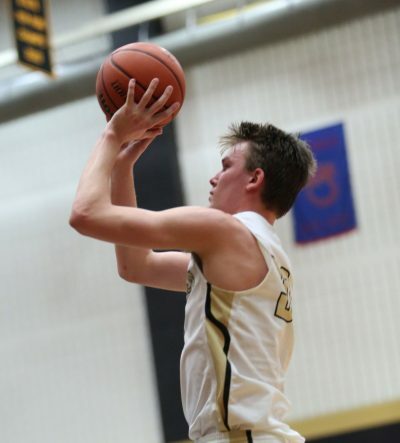 Penn’s Kingsmen wiped out deficits of 10 points in the first half, and eight points in the fourth quarter, but lost to Marian, 87-86, in four overtimes in a high school boys basketball game at Marian on Friday, Feb. 16. Last season, Marian beat Penn 72-69 in triple overtime. In Friday’s Junior Varsity Game, Penn rallied from a six-point deficit in the fourth quarter to beat Marian 59-53. Drew Lutz scored 27 points and had eight assists to lead the Penn Varsity effort in the four-overtime battle. Beau Ludwick scored 22 points. Noah Applegate scored 14 points and pulled down nine rebounds. Applegate also blocked four shots. Kegan Hoskins scored 12 points and Noah Krathwohl scored eight points. PENN 86: Drew Lutz 27, Beau Ludwick 22, Noah Applegate 14, Kegan Hoskins 12, Noah Krathwohl 8, Drew Schneider 0, Luke Carlton 1, Jeffrey Hemmelgarn 2, Carter Hickey 0. Marian 87: Hemingway 26, Ivey 17, Lattimer 24, Muphey 0, Decker 10, King 0, Quinn 10, Bishop 0. Three-pointers: PENN 7 (Drew Lutz 3, Beau Ludwick 3, Noah Applegate 1), Marian 7 (Lattimer 5, Ivey 2).